August 11, Scituate: I want to tell you that Hackers totally holds up. Now, you’re going to want to fight me on this one. You’re going to say “uh, rollerblading? techno music? progress bars? HACK THE PLANET?” Yes, I’m telling you, it holds up. It holds up as long as you expect all of this and you tack into it, fist up in the air yelling HACK THE PLANET with a half-grin plastered across your face. This movie totally captures a moment. Let’s talk about the bad first. Johnny Lee Miller plays a terrible teenager and a worse American. The dialogue is cringe-worthy. The graphic representations of the Internet set the standard for a whole genre of god-awful CGI. The fashion is a mess— the cut-off shirts! And they do indeed do a lot of rollerblading. Now let’s talk about what’s great about Hackers. This was a time in which Hollywood was digesting subcultures and spitting them back out as single movies. We’ve since shifted this work into documentary series on TV. But in the 1990s we did this with fiction— we gathered up all the clever dog whistle words and subculture totems and we presented the audience with a tame sample of your world, congratulations, you’ve made it. Hackers attempted to capture a whole mess of intertwined movements: proto-rave culture, computer hacking, 1990s NYC in general. And all the totems are there! The hacking part is what captured my imagination when I first saw the movie (well, the first of probably five theater viewings in about two weeks). It was amazing! This was a brief period of time in which having the simplest computer knowledge made you a wizard. A real wizard! Record a few tones emitted by a pay phone and suddenly you were making free long distance phone calls. Toss a few Unix commands at a Telnet command line and you were seeing all sorts of things you weren’t supposed to. Wizardry! And the best part was your parents literally didn’t know how to turn the computer on. 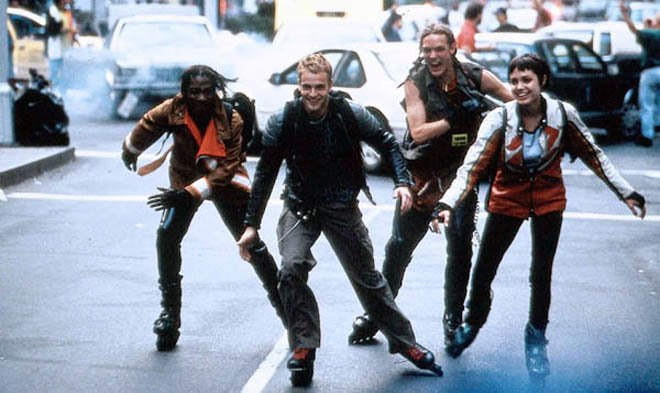 This is embarrassing, but Hackers totally changed my teenage life. My friend Chris and I started: a) rollerblading, b) listening to techno, c) hacking! We went from Andrew and Chris to “phritz” and “spam_i_am” and we became the terrors of a local dial-up freenet service. We got our hands on the rainbow books, we made a red box, and we listened to a ton of Lords of Acid and Prodigy and Orbital. But there was a great period of two teenaged wizards rollerblading around in oversized jeans listening to synthetic drum machine beats and this was all inspired by this one pretty terrible movie, a movie that *totally* holds up. HACK THE PLANET! Yes, you can buy the movie Hackers. And you should. This entry was posted in Movies, Reviews and tagged A Long Waltz Through Nerddom, Hackers on August 11, 2014 by magicandrew.